U.S. Army Sgt. 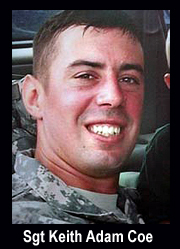 Keith Adam Coe, 30, of Auburndale, Florida, assigned to the 1st Battalion, 37th Field Artillery Regiment, 3rd Stryker Brigade Combat Team, 2nd Infantry Division, Joint Base Lewis-McChord, Washington, died April 27, 2010, in Khalis, Iraq, of wounds sustained when enemy forces attacked his unit with an explosive device. He is survived by his wife, Katrina; two sons, Killian and Keith Jr.; and daughter, Klover.